Please note that uninsured clients must be seen at a contracted clinical provider after enrolling in PrEP-AP. Find a contracted location at this link. Or, click the chat bubble on the right and PleasePrEPMe can help you find one. 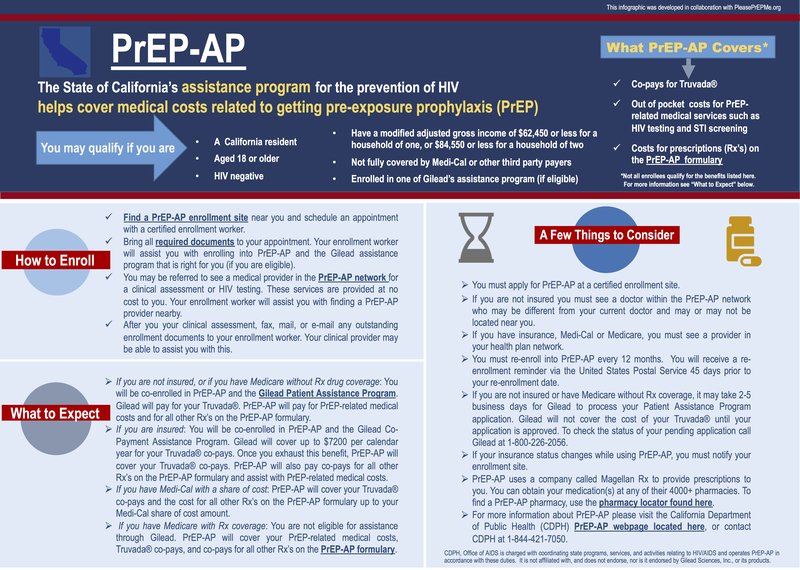 Kaiser Permanente (KP) members: The CA PrEP-AP is also available to members in need of financial assistance with out-of-pocket PrEP costs. As of 3/1/19 the Gilead copay card is no longer required. KP members can apply at ANY certified CA PrEP-AP enrollment site but will still be required to see their KP provider for PrEP services and pick-up prescriptions at KP pharmacies. Find a contracted enrollment location at this link. If you do not qualify for PrEP-AP you can check out other Payment Assistance Programs which you may be able to apply for, or simply click on the chat bubble to the right to talk to a knowledgeable agent about your options! Are you interested in becoming a PrEP-AP contracted clinical provider? You can find the application form at this link. Please contact us if you would like help with completing this form.